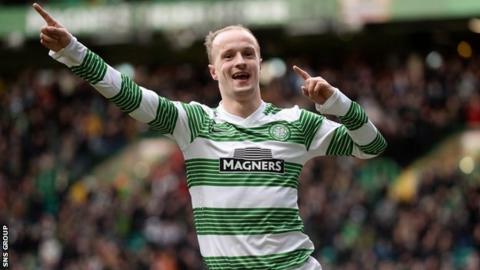 The Scottish FA has changed its charge against Celtic striker Leigh Griffiths to include a more serious offence. The charge now includes "singing in public a song of an offensive, racist and/or discriminatory nature". It follows reports of the Scotland international joining Hibernian fans in a song calling former Hearts player Rudi Skacel "a refugee". Last week, Griffiths was charged with "singing in public about Hearts in administration". Griffiths attended the recent Edinburgh derby at Tynecastle, watching the match with Hibs supporters. And his pre-match singing in a pub made newspaper headlines after it was filmed and posted on a video-sharing website. The SFA cited rule 86, which relates to "not acting in the best interests of Association Football". Disciplinary rule 79, "bringing the game into disrepute" has now been added to the charge. A principal hearing date of 24 April has been set for the case. A Police Scotland spokeswoman told BBC Scotland it would also be launching an investigation into the claims of racism, while Celtic are believed to have launched their own probe. Griffiths has already been disciplined internally by Celtic, but the Scottish champions have not yet commented about the latest footage. The player has apologised to Hearts and Celtic manager Neil Lennon has warned him about his future conduct.